One of Antarctica’s ice shelves, or rather its remaining section, is showing unprecedented levels of meltdown and will inescapably collapse in just a few years, further impacting the ocean levels on the planet, a new NASA study has warned. 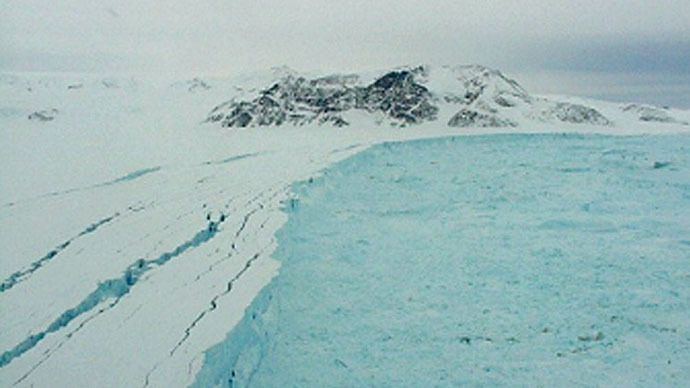 Research lead by scientists of NASA’s Jet Propulsion Laboratory (JPL) in Pasadena, California, probed the ice level of the remaining section of Antarctica's Larsen B Shelf, which partially collapsed in 2002, to discover that the huge block of ice, roughly the size of US State Rhode island, is likely to disappear before the end of the decade. The scientists used data derived from an airborne survey campaign of NASA's Operation IceBridge, to probe ice surface elevations as well as bedrock depths and compared reading gathered as far back as 1997. The study published in the journal Earth and Planetary Science Letters, asserts that based on the likely scenario that a huge ongoing rift will eventually crack all the way across the shelf before the end of this decade. Once that happens the free-floating ice block is likely to split into hundreds of icebergs that will drift away and eventually melt. Scientists worry that accelerated rate of melting glaciers will soon impact the world’s water levels which will have a detrimental impact on coastal populations. The study also found that Leppard and Flask, tributary glaciers of Larsen B’s remnant main satellite glaciers of the ice shelf, have thinned down by 65 and 72 feet (20 to 22 meters) in recent years, and has accelerated since the 2002 breakup. “The fastest-moving part of Flask Glacier had accelerated 36 percent by 2012 to a flow speed of 2,300 feet (700 meters) a year – comparable to a car accelerating from 55 to 75 mph,” NASA said in a press release.